A great resource when travelling Australia in a campervan is Wiki Camps, which costs approx $7.99 but it gives you loads of free camps, hostels, caravan parks and rest areas. There is also a great free app is campermates which offers the same services. Staying in free camps and caravan parks is great but it’s not the best way to meet people, there are many hostels on the East Coast which offer tent or camper spaces for a discounted price. So you can still enjoy the hostel life but pay to stay in your van. Unfortunately most hostels don’t take reservations for the camper spaces, it’s just a first come first served basis. Coffs Harbour is about 6 hours north of Sydney, it’s a coastal fishing city with Coffs Harbour Marina selling some of the freshest seafood. It’s also known for Big Banana which is a banana themed amusement park with water slides, laser tag, ice skating, toboggan and mini golf. Coffs Harbour YHA is located across the road from the harbour and close to the pristine beaches. They offer campervan sites for $15 per person per night which includes free wifi and a key to get in and out of the building. The hostel has a TV room, swimming pool, BBQ area and surfboards and bikes for hire. This hostel has limited spaces and the campervan spots usually full after 4pm. Nimbin is 70km inland from Byron Bay, Nimbin is surrounded by natural beauty of the World Heritage Rain forest including waterfalls, mountains and lakes. Nimbin is a renowned hippie destination and although in New South Wales the sale and possession of marijuana is illegal, it is openly obtained, sold and used in Nimbin. Nimbin Backpackers at Granny’s Farm is located a short walk from the town centre, the hostel offers budget camping right next to a creek and a field filled with friendly horses for $15.00 per person per night. The hostel offers a salt water swimming pool, television, communal kitchen with fridges, outdoor seating area and clean bathrooms. Byron Bay is a hipster beach town 2 hours south of Brisbane. Walking down the Main Street in Byron Bay you’ll have your pick of the choice in terms of travel shops. The beaches are fantastic and it’s a great spot to learn to surf, but you will pay more than some small towns. 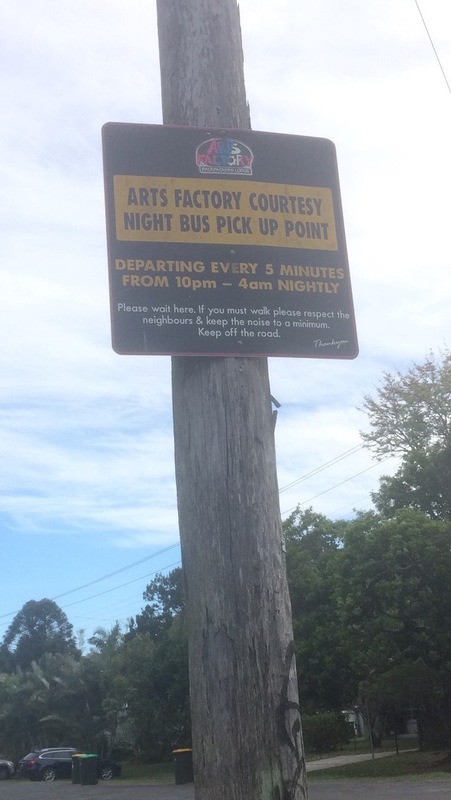 Nomads Arts Factory Backpackers is located 15 minutes walk outside the town centre, located next to Byron Bay Brewery. The hostel offers a free shuttle bus running between the hostel from 8.30am to 3am. If you’re wanting to sleep in your camper here then get in early as it fills up pretty quickly especially in the peak season. It’s best to get there after 11am which is when check out is and you’ll have the best chance. It’s $17 per person per night to stay in your van which includes use of the communal kitchen, swimming pool and volleyball court. Brisbane is located about half way between Sydney and Cairns and is often overlooked! Make sure you don’t overlook Brisbane as there’s heaps of cool things to do. From enjoying the free lagoon at Southbank to shopping on Queens Street Mall. Brisbane Backpacker Resort is located in Brisbanes West End, just 10 minutes walk from Southbank. The hostel offers a free shuttle bus to and from Roma St Transit Centre and Southbank between 8am – 7pm. The hostel has a fantastic swimming pool, basketball court, licensed bar offering $15 jugs and food from 5pm. If your wanting to stay in a campervan then BBR has only 3 spaces, it’s $15 per person per night or $10 per person if you’re staying in a Spaceship hired van which includes a key to the hostel, use of the communal kitchen and free wifi in reception. The town of 1770 is located just over 1.5 hours north of Bundaberg. This town is said to be the second landing point of Capital James Cook in 1770, hence the name. There are many beautiful walking trails and boardwalks around 1770 and Agnes Water. Southern Cross Backpackers is located just outside 1770 on 16 acres of land with a licensed bar and free shuttle bus to and from town. This hostel has a huge camping space right next to the hostel, it’s $15 per person for one night or $12.50 pp for 2 or more nights which is a bargain! Southern Cross Backpackers also offer the ScooterRoo tour from the hostel, leaving at 1pm everyday they teach you how to ride a chopper and then take you around 1770 and Agnes Water, heading down to the marina for sunset, it’s a must do for only $80 per person! Emu Park is a quaint beach village, 35 minutes drive from Rockhampton. Emu Park has beautiful picturesque beaches, the small village has an IGA, pharmacy, bakery and hairdressers. Emu Beach Resort is located just outside the village, with hostel rooms as well as spaces to stay in your campervan, it’s $20 per night for 2 people. The hostel has a licensed bar, communal kitchen, TV and swimming pool. The hostel can organise day trips for you including return transfers to Koorana crocodile farm and Great Keppel Island. Gladstone is located about 1.5 hours from Rockhampton, it’s a very industrial city with not much for tourists. The surrounding area are very picturesque with national parks and mountains. Gladstone Backpacker is centrally located on a suburban street, the hostel is a large house with swimming pool, licensed bar and wood fire pizza oven. This hostel offers camping and van spaces for $14 per person per night which includes wifi. There is also a well equipped communal kitchen and sundeck to enjoy. Airlie Beach is a most visit destination on the East Coast, all the Whitsundays tours leave from Airlie Beach port so it’s a busy location. Airlie is a backpackers heaven with tons of bars and hostels lining the small town, there’s also a lovely lagoon on the waterfront. Backpackers by the Bay is located just outside the town, about 10 minutes walk away. This hostel has limited spaces for campers, charging $15 per person per night which includes 200mb of free wifi. They have a lovely swimming pool overlooking the bay, as well as a licensed bar open from 5pm, but make sure you take cash because they don’t have a card machine on the bar. Yungaburra is located in the heart of the Atherton Tablelands, 15 minutes drive from Atherton. The Atherton Tabelands are located in far north Queensland, boasting fantastic scenery including the rain forest, waterfalls and lakes. Mamu Tropical Skywalk is a walkway above the rain forest offering amazing views for miles around. On the Wallaby is an eco lodge offering campervan spaces for $15 per person per night, this hostel has a communal kitchen, lounge and chill out area outside. The hostel will also arrange day trips to visit the local waterfalls and rain forest as well as overnight tours for you. Cairns is the gateway to the Great Barrier Reef with 100’s of tours leaving daily for the reef. Cairns is usually the beginning or end point of the East Coast and there are lots of backpackers about. Cairns has a great waterfront lagoon where you can soak up the sun and take a dip. Njoy Travellers Resort is located 10 minutes walk from the city but the hostel offers a free shuttle bus into central Cairns as well as to Cairns Marina each morning. Njoy offers campervan stays for $15 per person per night which includes free wifi. The hostel has a lagoon style swimming pool and communal kitchen. Port Douglas is a beautiful seaside town about 1 hour drive north of Cairns. Port Douglas is home to many boutique cafes and shops as well as home to four mile beach. Port Douglas has a market every Sunday with over 150 stalls with local crafts, produce and arts. Dougies is located just outside the town centre of Port Douglas, just 300 metres from the beach. This hostel has 4 spaces for campervans with powered and unpowered spots. The hostel has clean bathrooms, a salted swimming pool, licensed bar serving breakfast and dinner each day. It’s $26 per person per night or $30 for 2 people per night to stay in your camper which includes use of the communal kitchen and hostel facilities. Cape Tribulation is where two World Heritage Sites meet, the Daintree Rainforest and the Great Barrier Reef. Cape Tribulation is accessible at the Daintree River via Ferry which costs $27 return fare. Cape Tribulation is accessible by campervan but a 4×4 is needed to drive any further past Cape Trib as the roads are unsuitable for 2 wheel drive vehicles especially in the wet season. PK’S Jungle Village is located in the heart of Cape Tribulation offering campervan spaces for $15 per person per night for unpowered and $25 per person per night for powered sites. This resort style hostel has a restaurant onsite serving breakfast, lunch and dinner as well as a licensed bar open from 10am – midnight. Campervan guests are welcome to use the communal kitchen as well as the swimming pool.